A 20-barrel craft brewery just west of Winters, producing fresh, unfiltered, naturally carbonated beers. 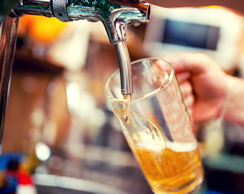 The tap room is located at the brewery, a relaxed, family-friendly atmosphere in a country setting, with indoor and outdoor seating, food trucks, and frequent live music. They pour full pints, half pints, and sample trays. More often than not, you will find cask-conditioned and barrel-aged beers drawn off a cask engine exclusively at the tap room. You can also buy 64 ounce growlers to go. 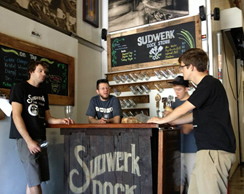 The brewery rotates their beers on a regular basis and produce a variety of seasonal beers. Both a tap room (16 taps of house-made beer) and a beer-making supply store, with Ales, Porters, and IPAs among a changing and inventive lineup. 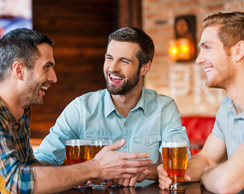 They offer classes so you can learn how to make it yourself as well as a Home Brew Club. Limited food menu; frequent live music and arts events. Growlers to go. The newest brewery in Yolo County, opened in the summer of 2015, Blue Note has a 6-barrel system using only 100-percent grains, with eight beers on tap in its spacious tap room. Raspberry Wheat is made with fresh fruit puree; you’ll also find Ales, Stouts, and IPAs. You can buy 64- and 32-inch growlers. Food trucks and entertainment happen regularly. Crafting prize-winning German-style lagers since 1989, and now on a mission to redefine the American lager. 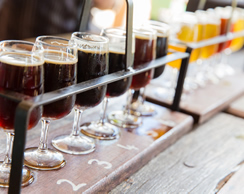 Rooted in traditional German brewing practices mixed with an innovative Californian twist, their hybrid beer styles can best be described as West Coast craft lagers. The adjacent Dock is a small 12-gallon system facility with a lineup that changes weekly. Brewery tours are available by appointment. The Restaurant serves a full menu with indoor and outdoor seating. Specializing in a variety of English, Belgian, and German style Ales, with 10 taps and a frequently changing lineup. 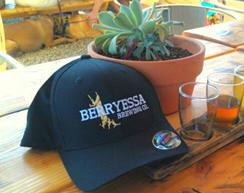 Founded in 2011, the brewers here craft beer founded in tradition but defies convention with California-style inventiveness. All of their beer recipes are created in-house, with even their 5-barrel brewing system was custom-built by the Jack Rabbit crew. You can buy 64- or 32-ounce growlers to go; they also sell kegs. Food trucks arrive Friday through Sunday. Makers of Ales, IPAs, Pilsners, Porters, Lagers, and Stouts, with all beers made from all-grain mash. This is a fun place to visit. Every Friday night is B.Y.O.V., or Bring Your Own Vinyl records to play on their vintage Hi-Fi system. They show movies, park food trucks, and bring in great bands for live music. You can also get involved in their Personal Brewery program and come away with your own creation. 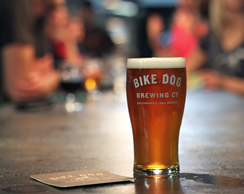 West Sacramento’s first brewery and tasting room, co-founded by four Sacramentans with a love for bikes, dogs and craft beer. This is a smaller 3-barrel brewhouse on site; brewing small batches means the beer is always fresh and allows for frequent new recipes getting on a regular basis. Most beer is available only in the tasting room; customers get to see the beer go from grain to glass and talk with the brewers one on one. They also have food trucks and occasional entertainment. 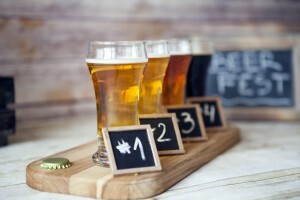 Three Mile Brewing Co. was founded by seven guys driven to create wonderfully unique, high quality craft beers for Davis and surrounding area beer connoisseurs. Three Mile Brewing produces small batch (3.5 bbl) craft beers that are distinctive and vary with seasons and availability of fresh, local ingredients. This enables our brewing team to experiment with unique styles and flavors. 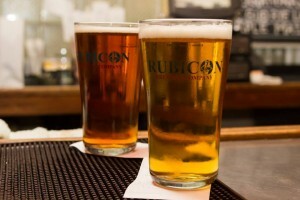 At Rubicon the beer is brewed with delicious local ingredients and their year round beers on tap include: Czech Pilsner, Monkey Knife Fight Pale Ale, and more. They also have a wonderful selection of seasonal beers that are special on tap so make sure you come on in to check them out for yourselves! They also offer a fantastic Rubicon wine selection for those who are feeling fancy. 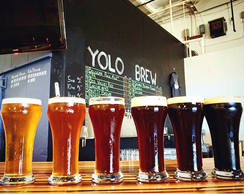 Click here to read about the Beer-Muda Triangle of Yolo County!